The county border between Oxfordshire and Buckinghamshire is indicated on this map by a red dotted line near the left margin. 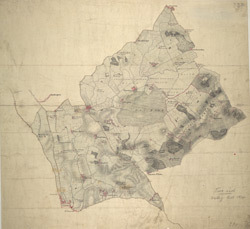 Ot Moor, an area of some 4,000 acres of fenland, appears at the centre of the drawing. Depicted around the moor are the remains of ancient woodlands: Prattle Woods, Horton Spinney, Studley Wood and Whitecross Green Wood.